April was a busy month for the very photo-talented (and photogenic) Curiosity Rover. In addition to another panoramic shot of the Martian landscape – which included Curiosity looking back at itself, making it a “selfie” – the rover also managed to capture a night-sky image that captured two minor planets and the Martian moon of Deimos in the same picture. At a time when Curiosity and Opportunity are both busy on long-haul missions to find evidence of life, these latest pictures remind us that day-to-day operations on Mars are still relevant. The first shot took place on April 20th (Sol 606), when rover scientists used the Mast Camera to capture the minor planets of Ceres and Vesta, as well as the moon of Deimos, in the same frame. Ceres is a minor planet with a diameter of about 950 km, and is the largest object in the main asteroid belt. With a diameter of about 563 km, Vesta is the third-largest object in the asteroid belt. Deimos, meanwhile, is the smaller of Mars’ two moons, with a mean radius of 6 km. this imaging was part of an experiment checking the opacity of the atmosphere at night in Curiosity’s location on Mars, where water-ice clouds and hazes develop during this season… The two Martian moons were the main targets that night, but we chose a time when one of the moons was near Ceres and Vesta in the sky. 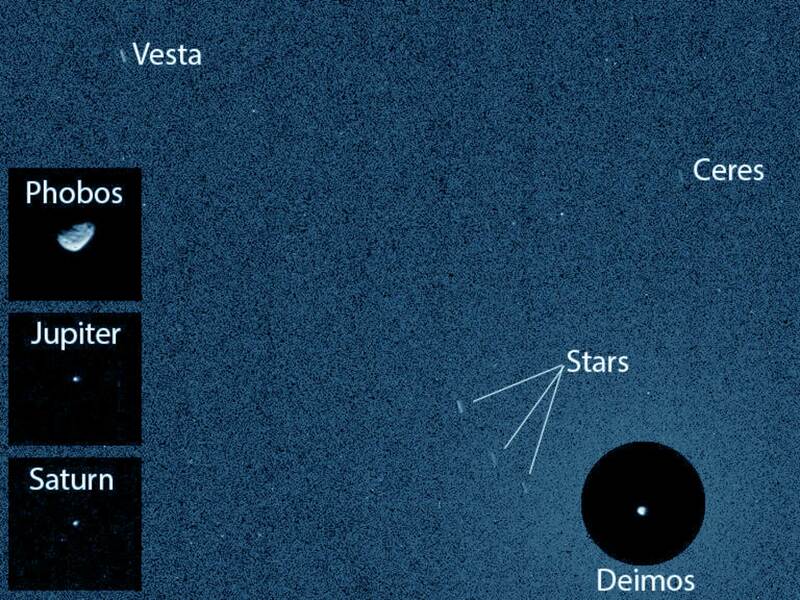 Deimos was much brighter than the visible stars, Vesta and Ceres in the same part of the sky, in the main image. The circular inset covers a patch of sky the size that Earth’s full moon appears to observers on Earth. At the center of that circular inset, Deimos appears at its correct location in the sky, in a 0.25 second exposure. 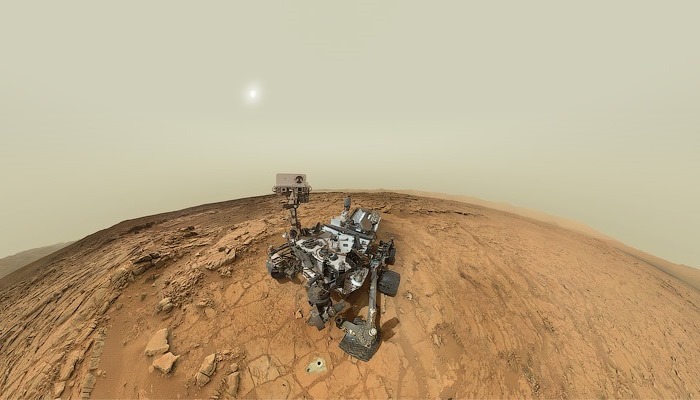 As for the latest in Curiosity’s long-line of panoramic self-portraits, this one comes to us courtesy of Jason Major. As a graphic designer and amateur space explorer, Major assembled the picture from about the dozen or so images acquired with the rover’s Mars Hand Lens Imager (MAHLI) instrument on April 27-28, 2014 (Sol 613). In the background, one can see the 5.5-km-high (3.4 miles) Mount Sharp (Aeolis Mons) that sits in the center of the Gale Crater. …with almost 21 Earth-months on Mars and lots of discoveries already under her robot belt, Curiosity (and her team) certainly have plenty to smile about! And the best is likely to still be coming. 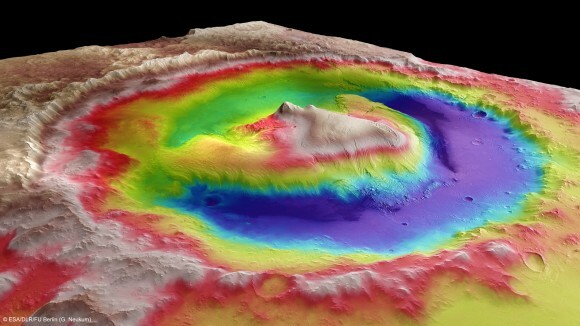 As we speak, Curiosity is making its way towards Mount Sharp and is expected to arrive there sometime in August. As the primary goal in its mission, Curiosity set off for this destination back in June after spending months studying Glenelg area. She is expected to arrive at the foot of the mountain in August, where she will begin drilling in an effort to study the mountain’s vast caches of minerals – which could potentially support a habitable environment. Stay tuned for more news from the Red Planet. And in the meantime, keep on trucking Curiosity!